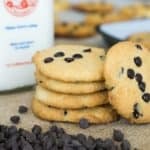 Almond Flour Chocolate Chip Cookies | Chewy! Combine the almond flour, beef gelatin, erythritol and baking powder in a small bowl and set aside. In a large bowl combine the metled butter, egg, and vanilla extract using a whisk. In two batches add the dry ingredients to the wet and combine until uniform. Fold in the chocolate chips. Using a cookie scooper or spoon scoop out 16-20 cookies onto your baking sheets, depending on your cookie size preference! Bake the cookies at 350 for 15 minutes or until golden brown on the top. Allow to cool for at least 20 minutes prior to consuming! Enjoy!